Naturalia bloomed in the Victorian period. People filled their parlors with ferns, terrariums, aquariums, shell collections, and taxidermy. Fondness for the natural world literally translated from parlor to person. 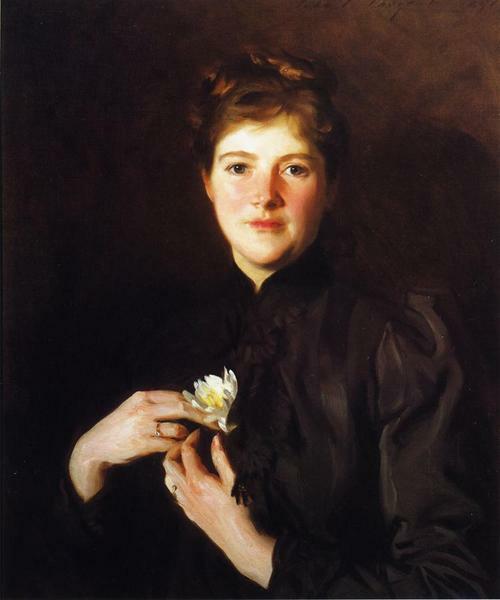 Flowers, fruit, furs, birds, feathers, reptiles, and mice were popular decoration for the fashionable accessories of the late nineteenth-century and predominantly so on women’s hats. Between the years 1870 to 1920, the height of the feather trade, feathers, wings, and even entire birds adorned the hats of fashionable women. 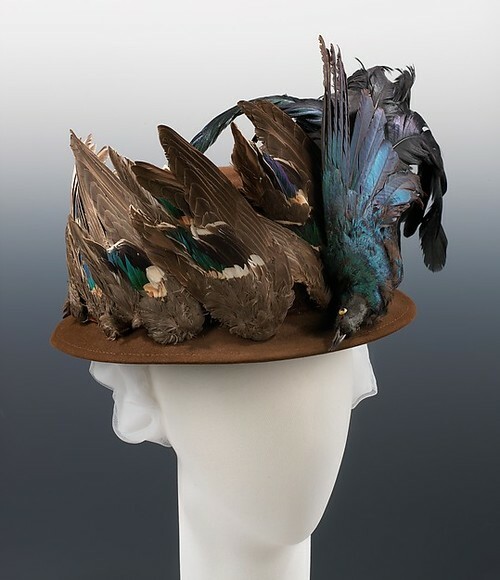 In fact, in 1886, ornithologist Frank Chapman observed a remarkable number of bird-adorned hats in New York City. He noted that, among 700 ladies he observed, three-fourths of them wore 40 varieties of native birds, or bird parts. Significant Victorian era tastemakers contributed greatly to the period’s penchant for plumage. 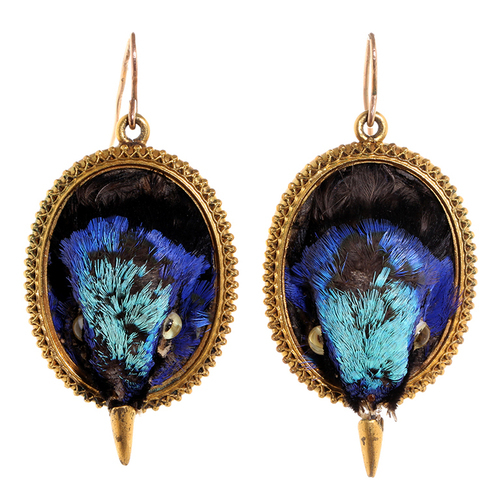 In 1867, Empress Eugenie of France wore bird-adorned accessories while visiting a seaside resort. The Princess of Wales, Alexandra, was also known to own accessories embellished with hummingbird feathers. At the 1872 London International Exhibition, the display of jewelry composed of South American beetles and bird feathers also contributed to the trend. Nearing the turn-of-the-century, the alarming rate of depleting bird populations prompted a conservation movement. 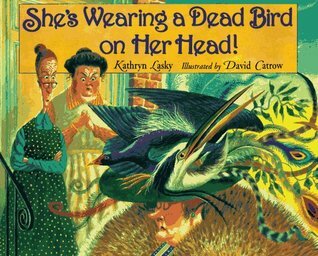 Karyn Lasky cleverly transformed this curious subject into a children’s book appropriately titled, She’s Wearing a Dead Bird on Her Head. 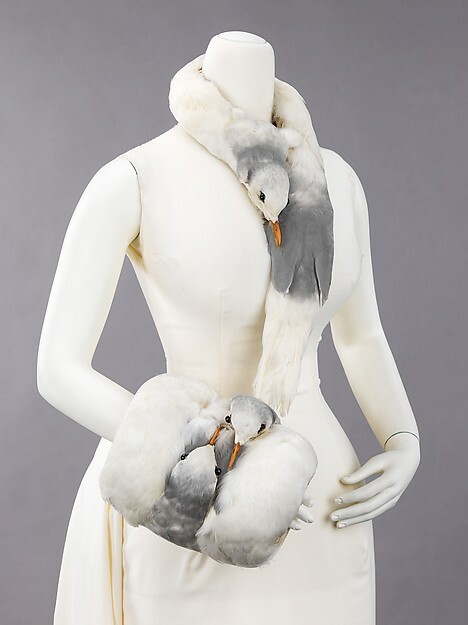 Lasky’s real-life protagonists, cousins Harriet Hemenway (1858-1960) and Minna Hall (1859-1951), are appalled by this rampant fashion for feathers and decide to take matters into their own hands. Would you listen to a woman with a dead bird on her head? Harriet and Minna decided to invite all the fashionable ladies of Boston to a series of teas, encouraging them to forego birds for ribbons and other forms of millinery ornamentation. Harriet and Minna succeeded in convincing about 900 women to boycott feathered hats and advocate for bird protection. These afternoon teas laid the foundation for the Massachusetts Audubon Society. They soon recruited men as well, a significant step in voicing their concerns to Washington. Their efforts made great strides in protecting the most threatened bird populations. In 1903 an act was passed protecting herons and bitterns, two species commonly used by hatmakers. In 1904 bird protection expanded to include shore, marsh, and beach birds. Laws against hunting birds during mating season soon followed, and eventually a law passed halting the use of feathers imported from Europe and the tropics for making hats. Lasky took artistic liberty to explain how Harriet and Minna made an effort to shut down the illegal plume trade at the source by identifying a feather supply warehouse. Lasky imagines they traveled to New York City and went to a fancy Fifth Avenue hat shop where they, quite begrudgingly, purchased bird hats to identify the feather supplier. Harriet and Minna made a significant impact in saving birds, bringing national attention to an important conservation issue. By the turn-of-the-century the Victorian appreciation for the natural world changed course. Rather than domesticating nature, attention turned to preserving it. Gere, Charlotte, and Judy Rudoe. Jewellery in the Age Of Queen Victoria: A Mirror to the World. London: British Museum Press, 2010. Lasky, Karen. She’s Wearing a Dead Bird on Her Head. New York: Hyperion Books for Children, 1995. “The Feather Trade and the American Conservation Movement,” Smithsonian virtual exhibition.